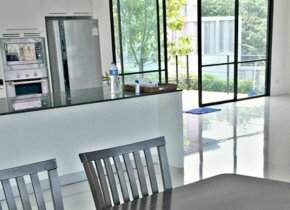 Splendid beach front 5 bedroom villa in Lamai covering the area of 846 sq meter with direct beach access, constructed using imported high quality materials, furnished in a stylish manner and having smart home system control. The villa has its own swimming pool with jacuzzi, outside dinning and bar, living room with projector, sound system and home theatre, pool table, fully-equipped kitchen. This villa will make your vacation ideal. - room cleaning everyday, bedsheets changed every two days. -Security 24 hours including a guard on the beach all night. - Pick up two ways airport.